The Eagle Creek family of companies has nearly four decades of commitment to the Twin Commander community, winning awards and top ratings for our service centers’ performance and our innovation in keeping the fleet flying safely. The Eagle Creek family of companies has nearly four decades of commitment to the Twin Commander community, winning awards and top ratings for our service centers’ performance and our innovation in keeping the fleet flying safely. Simply stated, no other company can offer more services, experience, proven success and commitment to Twin Commander owners than Eagle Creek. Eagle Creek and Naples Jet Center are the world leaders in Twin Commander sales, service and maintenance. We continuously look for ways to offer the broadest range of Twin Commander support from minor maintenance and upgrades to major refurbishments. More than $15 Million in Twin Commander Parts Inventory – If you need it, we have it. Eagle Creek’s technicians have experience in a wide range of avionics from simple repairs to component installations and upgrades. Building on our 30+ years in Twin Commander sales, service and refurbishment, Eagle Creek Aviation is proud to offer the Garmin G950 glass flight deck for the Twin Commander. Keep your downtime to a minimum. we have the extensive inventory and loaner units to keep your downtime to a minimum and keep you flying. Perhaps you are looking to redesign your entire flight deck. We offer intelligent, custom configurations of flight and aircraft data in a highly intuitive environment. 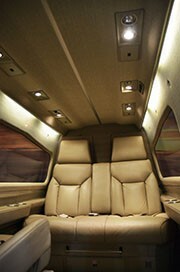 We truly love the Twin Commander and are proud to have nearly 40 years of innovation and experience. Here are some of our founder’s favorite pictures over the past several years. Whatever your need, you can count on Eagle Creek’s reputation for integrity, professionalism and good communication throughout the transaction process. Upon completion, no other aircraft in its class can challenge a Renaissance Commander® in performance, safety, and resale value. The Renaissance Commander Program is a unique and cost-efficient “package-priced” factory parts program, combined with the knowledge and experience of Twin Commander’s worldwide factory-trained service center network. Twin Commander specific training for maintenance technicians is available in a (Twin Commander Aircraft) factory authorized course at Eagle Creek Aviation. Introduction to normal systems operation leading to analyzing system malfunctions in a cost-effective manner. Discussion of recent manufacturer’s service information and product updates. Opportunities to share maintenance experience with other course participants. The Garmin G950 MFD map display is designed to interface with a number of remote sensors and tracking systems, making it easy for pilots to overlay graphical weather, lightning, traffic, terrain and other avoidance system advisories. The Garmin G950 Twin Commander will also display engine data on the MFD, getting rid of the old “steam gauges” and providing for a clean, integrated look. This total panel transformation also includes all new fuel, oil and hydraulic system pressure transducers and new engine fuel flow transmitters. All of these new components make the problematic maintenance and parts available issues with the old panel and instruments go away, along with up to 150 pounds of wiring and equipment. 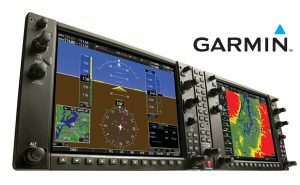 This all-electronic Garmin panel will integrate all primary flight, navigation, communication terrain, traffic, weather and engine instrumentation systems on a large 12.4-inch multifunction display and two 10.4-inch primary flight displays. FAA published an Airworthiness Directive mandating compliance with the aft pressure bulkhead area inspection procedure and modifications specified in Twin Commander Aircraft Service Bulletin 241, which affects certain 690/A/B Twin Commanders. Upgrade your avionics panel with a G600 suite and start reaping the benefits of enhanced situational awareness, safety and pilot workload reduction. The dual-screen G600 works with your Garmin avionics stack, pairing both a primary flight display (PFD) and a multi-function (MFD) display in a single 10-inch wide bezel – to provide a fully TSO’d upgrade option for your cockpit. 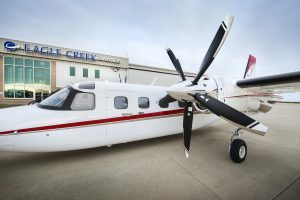 Through the Twin Commander Grand Renaissance program, Eagle Creek offers a completely restored, extremely reliable, safe to operate, high-performance aircraft. It also has operating costs unmatched by any new production aircraft in its class. Upon completion, no other aircraft in its class can challenge a Renaissance Commander® in performance, safety, and resale value. The Renaissance Commander® Program is a unique and cost-efficient “package-priced” factory parts program, combined with the knowledge and experience of Twin Commander’s worldwide factory-trained service center network. The Renaissance program guarantees Commander owners the workmanship, quality, and service they expect. The benefits of the Twin Commander Grand Renaissance program are even greater when delivered by Eagle Creek, the world leader in Grand Renaissance Completions, and Twin Commander sales, service and support. Performance and Value. No other aircraft in its class comes close to the Twin Commander in performance, safety, and resale value. Airframe Renewal. The Renaissance Commander Program takes the risk out of purchasing a pre-owned Twin Commander through rigorous factory-sanctioned airframe refurbishment standards. Total Product Support. Twin Commander Aircraft offers support through a worldwide network of factory-authorized service centers. Modern Performance. The contemporary aerodynamic design delivers an unmatched blend of high cruise speeds, fuel efficiency, and short field performance. New Enhancements. The -10T Engine Modification Program delivers 300+ KTAS cruise speeds and spectacular times to climb. Engine maintenance costs are reduced with a special 5,000-hr TBO and a single mid-life hot section inspection (HSI). Retrofit your 690A, B, 840 or 900 Twin Commander with factory certified TPE331-10T engines and aircraft parts backed by Twin Commander and Honeywell. The Dash 10T provides a noticeable torque gain at altitudes over the -5 engine. The Dash 10T engine powered 690A test aircraft consistently demonstrated 300-310 KTAS cruise speeds at 20,000 feet, depending on aircraft weight. The Comfort Cabin system has proven very successful in lowering cockpit and cabin noise levels as much as 6db (50%). Starting from the nose of the aircraft, we studied every area susceptible to noise transmission. We believe we have developed a fantastic solution for Commander owners, to limit noise in the cabin, with a substantial weight decrease over out-dated insulation packages, and most importantly, at an affordable cost! Radome to Tailcone Refurbishment Program Airframe—A thorough log book audit plus a radome-to-tailcone inspection begins the process of uncovering bypassed or deferred items, squawks, or defects. The aircraft is disassembled and thoroughly inspected, system-by-system, bolt-by-bolt. Items found are corrected / repaired / replaced as necessary. 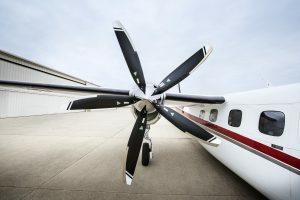 The drop-in LED package –– Custom Kit 190 –– replaces older-technology fluorescent-bulb systems on 690A model and later turboprop-powered Twin Commanders with lighter, brighter, longer-lasting LED lighting. The eight LED lights are a simple remove-and-replace with existing fluorescent bulbs, using existing receptacles in the passenger cabin. It is a simple, easy installation and the new LED lights cast a nice, even distribution of light throughout the passenger cabin. Questions about Maintenance or Upgrades for your Twin Commander?